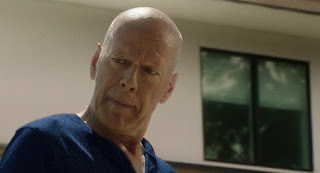 As larger-than-life as the characters he plays, much like Nicolas Cage, Bruce Willis has starred in approximately 265 direct-to-disc movies over the past 5 years. 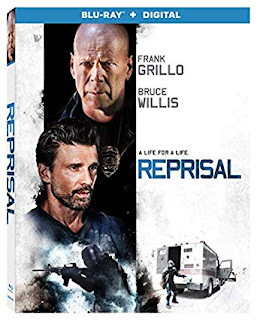 And sure enough, as the action hero's latest Blu-ray begins, we're treated to a series of his recent trailers which together play like a short prequel, setting up director Brian A. Miller's aptly named Reprisal. Of course the upside of Willis being in so many movies is that we never have too long to wait for a new release as there's one available almost as often as a new episode of Moonlighting aired back in the 1980s. But at the same time, for a man who first blew us away walking across broken glass in every movie lover's favorite holiday action movie, Die Hard, with so many films on Willis's schedule in a calendar year, his characters continue to get smaller and more illogical as filmmakers try anything to squeeze him in before he's due on another set. Case in point is Willis's poorly developed character James in the slight yet modestly entertaining B-movie Reprisal. A walking contradiction, instead of helping his civilian next door neighbor Jacob (Frank Grillo) track down the highly-skilled criminal that robbed his bank, killed one of Jacob's employees, and may have cost him a job, ex-cop James merely spends a few days brainstorming up a nonsensical Homeland style case-board with Jacob. At last thinking they have a good lead (though it isn't fully clear how), rather than take it to the authorities or offer the former police officer's son some actual backup, James simply hands Jacob an old police radio for emergency use and sends him out on stakeout duty, which is predictably when – as the law of action movies dictates – all hell breaks loose. Going against James's advice, after stumbling into the secret lair of super villain Gabriel (played by Johnathon Schaech), Jacob soon finds himself in the middle of yet another deadly Cincinnati robbery. While thankfully Bruce Willis gets to leave his location at the house next door for the film's big action sequence near the end of the movie, having a badass ex-cop stuck confined to a roughly 30 foot radius with zero explanation – when even one or two lines of dialogue could suffice – is disappointing to say the least. Raising even more suspension-of-disbelief problems for Reprisal's overall storyline, without James there to guide him, Jacob does something so insanely out of character that he risks the lives of, not only himself and Willis's largely housebound ex-cop, but also the two people he loves most in the world in the form of his wife (Olivia Culpo) and diabetic daughter. A clunky segue from Points A to B designed to raise the stakes and lead us into Reprisal’s more suspenseful third act, first time screenwriter Bryce Hammons could've easily figured out a more organic way to reach the same plot-point of a standoff that's at least in line with the character he's created in Jacob. And regrettably it's one of a handful of red flags that pull us out of what had thus far been a pretty solid direct-to-disc action movie, thanks largely due to the strength of its cast. 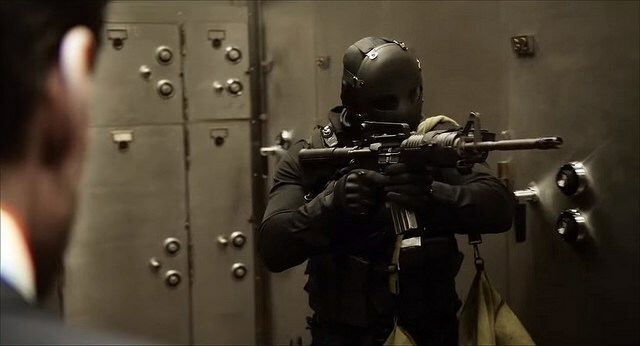 For although Gabriel's rush into another robbery following his daring heist in the movie's impressive first big action sequence makes us wonder if at least one key scene was left on the cutting room floor (as the sequences of him planning for his next job make it appear to be something grander in scale), Schaech puts some real menace into his scenes. 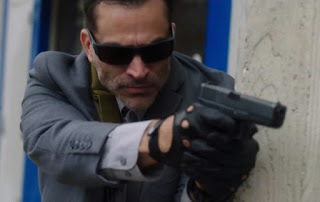 A far cry from his breakout performance in That Thing You Do!, just as he has been in a number of recent projects on screens big and small, once again, Schaech is impressive in an against type role where, he and Frank Grillo (in particular) do their best to flesh out their admittedly thinly drawn characters. And fortunately their efforts helps us stay with them – for awhile at least – as the film takes the first of several turns that don't make much sense. Able to quicken pulses during both the bank heist as well as the film's intense yet predictable conclusion, it's apparent that much like the actors, Reprisal's director (who's helmed a few other movies for Willis) is also hindered by its uneven script not to mention obvious budget and scheduling issues. Well made enough to entertain as part of a double or triple feature of Willis titles at home on a Saturday night, for the most part, Reprisal distracts us from asking too many questions, aside from why of course an ex-cop like Bruce Willis's James finds himself so often stuck in a single room unless that's all they had time for before he was due to report for another movie. Fortunately, since it's been nearly a week since the film debuted on Blu, we don't have to wait too long for the next Bruce Willis (or Nic Cage) premiere. Likewise, given the intriguing place where Hammons ends Jacob's storyline in the film, I wouldn't be surprised if pretty soon we get another Reprisal, with not only three times as many trailers but even more scenes of Bruce Willis giving his neighbor crime stopping advice from a (hopefully new) stationary location.